Fourth United States Army is a rarity: a Field Army with no combat record. Originally formed in the Organized Reserves (today’s Army Reserve) as Fourth Army in 1922, it was withdrawn from the Reserves a decade later and made part of the Regular Army as an inactive organization. It was reactivated in 1933 and headquartered first at the Presidio in San Francisco and then at Fort Sam Houston in Texas following the end of World War II. But Fourth Army sent no troops to Europe or Japan during that war, and during the Vietnam era it ran an Infantry training school. Disbanded in 1971, its Headquarters was reactivated in 1984 at Fort Sheridan, Illinois, home of U.S. Army Recruiting Command. It was inactivated for the final time on 30 September 1991. 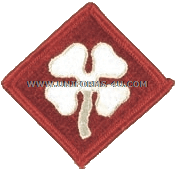 The cloverleaf on the United States Fourth Army Shoulder Sleeve Insignia reflects the organization’s numerical designation, and the colors of red and white are traditionally associated armies. Its motto of “Leadership And Integrity” were the touchstones of the training programs it oversaw during World War II, the Korean War, and the Vietnam conflict.